When I got the call that I had made the Top 100 for MasterChef Season 6, I was beyond thrilled to be in the category of one of the top 100 home cooks in America. But what I didn't realize at the time is that in the week I would spent in LA, I would form amazing friendships with people who had as much of a passion for food and cooking as I did. Alex Charpentier was one of those friends. We spent nights drinking wine and sharing our culinary dreams and goals. She has a great blog where she has shared some of her journey through culinary school, food, fitness, and life: http://www.berkeleybabe.com/ This delicious recipe was inspired by her mother who recently passed away... Here's her cooktale: Growing up in a French family we tended to put a French flair on our Thanksgiving meal but one thing that we did keep traditional was dessert. I have always had a passion for cooking and over the years even prior to attending culinary school I mastered several desserts that my family has grown to love. One of them that I have been making for more than 20 years is my AppleCrumble Tart. 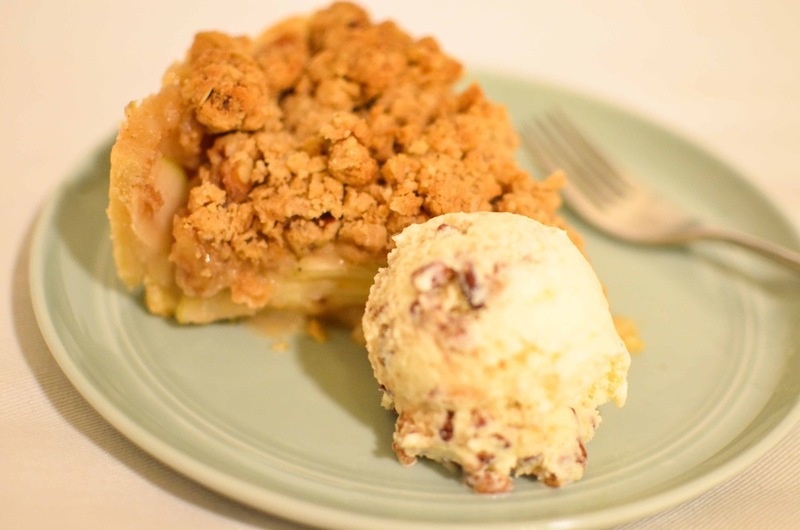 I used to serve it with store bought vanilla ice cream but two years ago I bought myself an ice cream maker and have been churning out my own delicious flavors to compliment my tart ever since. This Thanksgiving, in honor of my mother who tragically passed away this summer and will thus not be with us I made her favorite ice cream flavor, butter brickle. Shewas after all French and loved anything with butter! Equipment: You will need a spring-form pan and a food processor for this recipe. 1. In the bowl of a food processor, add the flour, sugar and salt and pulse to combine. Add the diced butter and pulse just until you have pea-sized pieces of dough. 2. Gradually trickle in the water into the dry mixture and keep pulsing just until a ball of dough forms. (You do not want to over work your dough). Remove it and form it into a large disk, wrap in plastic wrap and chill for two hours. 1. Prepare crust: coat a 9-inch spring-form pan with non-stick spray. On a floured surface, roll out chilled dough into a 16-inch round – 1/4 inch think. (Tip: Once you have the dough rolled out, use your rolling pin to roll the dough around it and carefully lift the whole thing up and easily transfer it to the spring-form pan!) Trim the overhang and then place the pan into the fridge while you prepare the apples. 2. Preheat oven to 375 degrees. Peel, core and slice the apples in the food processor using the slicing blade. Place them into a large bowl and with the lemon juice and toss to coat. In a separate small bowl, whisk the sugar, flour, salt, cinnamon and nutmeg and then mix into the apples. 3. Scoop out the apples using a slotted spoon to avoid getting too much liquid from the lemon juice and layer the apples into the prepared crust spreading them as flat and evenly as possible (you may have extra apples, do not over fill the tart or your streusel will overflow so leave a bit of room). Bake tart for 30 minutes on the middle rack of the oven (if the tips of the apples begin to brown and burn, cover the top with foil). 4. While the tart is baking, make the streusel topping. In a medium bowl, stir together sugar, cinnamon, nutmeg, salt, flour, oats, walnuts and baking powder. Pour in the melted butter and mix to combine. Refrigerate until tart has baked for 30 minutes. 5. 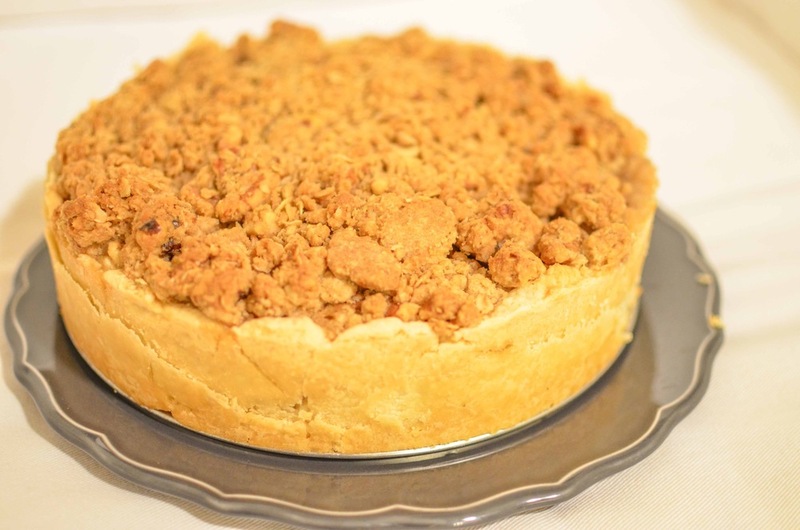 After 30 minutes, remove the tart from the oven, decrease the oven temperature to 325 and then gently press the streusel onto the top of the apples. Return to the oven and bake on the lower rack of the oven for an additional hour. (Cover with foil if the streusel begins to brown too quickly). 6. When the tart has finished baking, remove it from the oven and let cool to lukewarm. Run a knife around the crust to loosen the edges from the pan. Carefully loosen the clamp on the spring-form and slide it over the top and off the tart. This tart eats best when brought to room temp with homemade ice cream (recipe to follow). Directions 1. Melt the butter over low heat in a heavy skillet. Add the pecans and salt and sauté, stirring constantly until the pecans start to turn brown. Drain the butter into a small bowl and the pecans into another bowl; let the butter and nuts cool. 2. Using the whisk attachment to your stand mixer, whip the eggs until light and fluffy, 1-2 minutes. Add the sugar a little at a time and continue to whisk until completely blended, about 1 minute. Pour in the milk and cream and whisk to blend. Add the cooled, melted butter and blend at low speed. 3. Transfer mixture to an ice cream maker and freeze following the manufacturer’s instructions. 4. 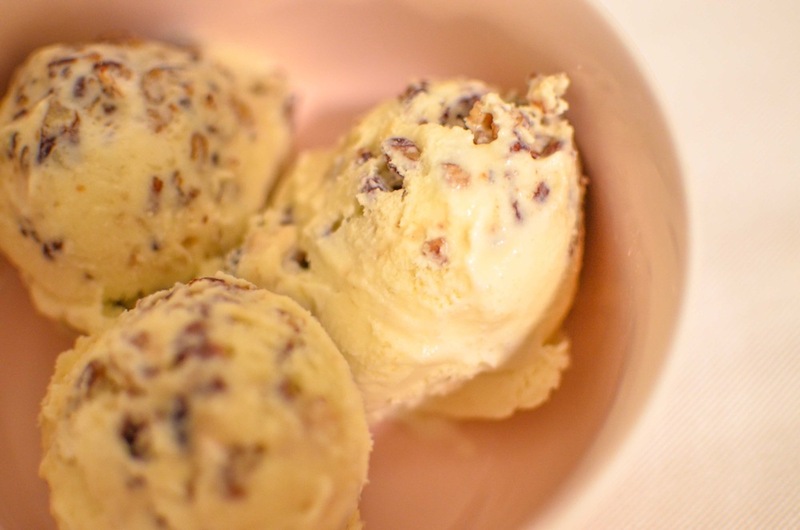 Add the toffee bits and pecans about 2 minutes before the ice cream is done (when it starts to stiffen) then continue freezing until the ice cream is ready.